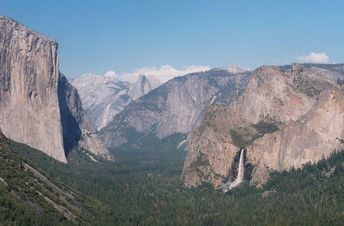 This .7 mile hike offers a great vantige point for viewing Yosemite Valley. The valley can be tough to photograph for various reasons. First, the rising sun comes up directly through the valley making first light shots difficult. In the evening, the setting sun cast shadows through the valley making evening opportunities difficult. From Tunnel View Overlook, cross the road and take the Inspiration Point trail for about 1 mile. There will be several clearings that offer great views of Yosemite Valley. Free park maps, tide tables reports, ebooks and additional information can be found under the Maps and Resource tab located in the black bar at the top of the screen.